Alejandra Valles: My name is Alejandra Valles. I am the Secretary Treasurer for SEIU United Services Workers West. The union represents janitors, security officers, and airport workers across California. Sarah Jaffe: You are one of the organizers of the Caravan Against Fear that is going on right now. AV: The Caravan Against Fear was organized by SEIU USWW. Also, Global Exchange, Rompevieto TV in Mexico City. But then, also, over two hundred and thirty organizations, bi-national organizations, that have come on board. The National Day Laborer Organizing Network is also one of the main organizers. We really decided we needed to figure out how to mobilize the masses and how to break through this paralysis of fear that the Trump administration has been strategically trying to implement across the country and the world. SJ: Tell us about it. How has it been going so far? Where are you currently? AV: We are in Tucson, Arizona. Now I am sitting here at a refugee owned Ethiopian restaurant, a small mom and pop that had heard about the caravan and reached out and wanted to host a lunch for us. It is beautiful to get a warm meal on the road since we have been eating fast food and junk food. Believe it. We stopped here and had some authentic Ethiopian food. The restaurant is refugee owned, so that means so much to us that folks are learning about the caravan’s mission and want to help in whatever way they can. We have already gone through–we are on the twelfth day, I believe. We have gone through all of California from Sacramento to Bakersfield, Modesto, Presto, San Diego, Los Angeles, Santa Ana, and then we came to Arizona. We went to Phoenix and were received there. We also went to the Tohono O’odham Reservation at a mission that they have there to talk about their opposition to the wall in their sacred land. We are in Tucson, Arizona protesting against Martha McSally who is the congresswoman who has been very anti-immigrant in her stance in congress. SJ: How many more days do you have? AV: We are going all the way until May 1. We still have a little over a week and a half, almost two to go. We have been sleeping in churches. We have been sleeping on the floors. Anywhere that will open up their offices to us or their pews. We are on our way to Nogales where we will be greeting and meeting with a bunch of community folks there who will tell us about what it is like in Nogales for migrant workers and for the work that they are doing on immigration justice. Then, after that, we are going to go to Las Cruces tomorrow where we will be speaking on behalf of a sanctuary ordinance that the City of Las Cruces is thinking of trying to pass. The caravan really is lifting up resistance efforts across the country. How can we demand more from our local communities, our city councils, to stand up and to fight back against the Trump administration rhetoric of anti-immigrants polices and fear tactics? SJ: I want to talk about May Day, but first I want to talk a little bit about your union and why it is important for your union to be involved in this fight? AV: I think it is incredibly important for all of the labor movement to be involved in this fight. We have seen a fight around issues of class and wages and benefits for workers, but the issues of racial justice of BlackLivesMatter or immigration justice of environmental justice are really at the forefront of our members’ lives every single day. Before they are a worker, they are an immigrant. Before they are a worker, they are a black human being. Before they are a worker, they are a mom and dad and friend and a sister and a daughter. We just decided that we needed to take this on. The caravan itself is incredibly diverse. It is built of people, of African Americans who have been criminalized for decades and know what it is like to be discriminated against and killed and disproportionately impacted because of the color of their skin, but it is also built of a lot of immigrant women who also know what it is like to be marginalized and to be discriminated against and exploited because of their immigration status and because they don’t speak English in this country. Donald Trump needs to respect our human worth, and this administration needs to respect our economic worth. We really felt strongly that we need to resist at every level. Our employers need to resist when ICE comes knocking at their doors. Our community needs to resist and rise up the way we have in other moments, like 2006. Our congressmen and assemblywomen and men have to resist, as well. We said, “We have to break through this paralysis of fear that Trump is using to try to keep us from doing anything and to try to keep us scared of our own shadows and living in this underground economy.” But, at the same time, we have also seen him targeting people of color, starting to publish lists, and really criminalizing us in a lot of different ways. That is what we are out here doing. We are telling all the community, we are telling young kids, “There is nothing wrong with us. We are hardworking people. We help make this economy work and we are going to stand up for our rights” and hoping that the rest of the country and the world will follow. SJ: Your particular union has a history of being involved in immigrant workers rights and the 2006 Day Without An Immigrant. Right? AV: Our union has led the fight on Justice for Janitors back in the eighties and nineties when immigrants were beaten by the LAPD in Century City and also went out on a massive strike of almost 88,500 workers that shut down the City of Los Angeles. Our union has been fighting for immigration justice for decades, to bring workers out of the shadow and into unions themselves and the labor movement, embrace them and organize them and lift the standards for all workers. At the same time, we have also been incredibly involved in looking at what is happening to black workers, black workers who at one point made up and had a large population in the City of Los Angeles and across California and also make up a large portion of a lot of the industry. We have seen a displacement of black workers in our country and in California, specifically. We have been very involved in organizing black security officers. Many of them who wear a uniform but live in poverty. We are fighting for black worker justice and highlighting why it is that black workers are disproportionately impacted and discriminated against at work, but then also in their own communities. We need to stand up and make sure the whole world and that Donald Trump and his administration understand that we help make this economy work. We pick the fruits and vegetables that end up at our tables. We wash and clean the toilets of the richest buildings, many that Donald Trump himself owns. We guard and we protect our communities. We put on our uniforms as security officers to make sure some of his buildings and other buildings across the country are protected and also where we are first responders any time a natural disaster or emergencies happen. We contribute to this economy every single day. Donald Trump needs to respect our human worth, this administration needs to also respect our economic worth, as well. That is why we are going to shut it down on May 1. SJ: Since the election of Donald Trump the strike has really kicked up another notch in the public consciousness. There was a lot of debate around the Women’s Strike about whether it was privileged to take a day off from work. I would love to hear you talk about why it is important for the least privileged workers in our economy to actually use the strike as a weapon. AV: Personally, I believe that all of the different instances, the Women’s March was an incredible inspiration. It was the largest mobilization that we have had in the history of our country. I think that is the way we make change in this country, in this world. It’s when people who are not necessarily impacted the same way as marginalized communities, when those people are standing up, they are taking risks, and they are helping to lead that charge. Martin Luther King said that loud and clear, when you have white allies, you have interfaith allies that join the front lines, that is when you started to really make a difference. I think that all the groups that are trying to do their best to resist in this moment are putting their little grain in the sand and inspiring us. But, I also do believe that amongst us—even myself, I am a U.S. citizen, my parents were undocumented—all of us need to take a look at our own privilege and figure out how we, as human beings, help lift up somebody who is not as privileged, who is marginalized and who is more vulnerable and disproportionately impacted either by their status or because they are women of color or people of color. I believe that this is the moment. I am hopeful and inspired by what I have seen so far. I really do believe that all of what we have been doing is preparing us to May 1. I think a lot of those efforts have been building towards this major escalation and then, it doesn’t end on May 1. We are going to have to continue. I feel very hopeful about it and I think that anything any of us can do, [we should] but always constantly reminding ourselves that we do have that responsibility to carry others on our shoulders and create real spaces for them to lead and to come around their struggles and build solidarity, that’s the way that we will defeat the racism and the hate of the Donald Trump administration. SJ: Tell us what May Day is going to look like in Los Angeles? AV: May Day is going to be incredible in Los Angeles. We are expecting thousands of people. There are estimates right now that there is going to be probably more than there were at the Women’s March. It is on a Monday, so we have been talking to businesses. You can see our posters up all over the Fashion District, all over Highland Park that say “Somos El Pueblo. Shut It Down May 1” “Somos El Pueblo. 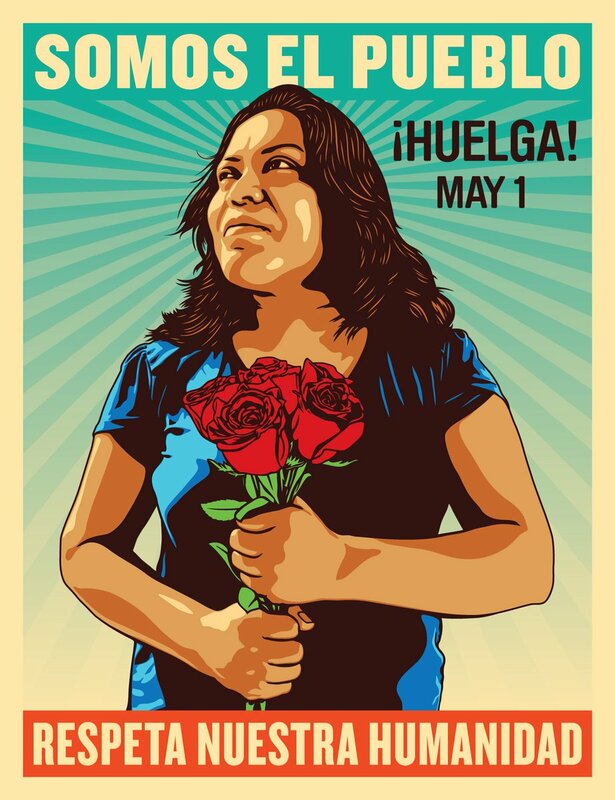 Huelga May 1.” They are beautiful posters that Ernesto Yerena who trained with Shepard Fairey who also did “We the Resilient” for the Women’s March has really added that element of art and culture to this movement. I really do believe that it is going to be lively. I think it is going to be full of arts and culture and this amazing heartbeat of sacrifice, of people of color, of white allies, of women, A Day Without An Immigrant. We are also working with some musicians who want to come and to perform. But, we are literally calling for not just showing up to work on May 1, to shut down your business, to walk out of school, to come out with your family members to march with us. There is going to be a local march, lots of them, it’s not just Los Angeles, it’s San Francisco, Oakland, San Diego, Santa Ana, Orange County. We really do believe that this is going to send a strong message to the administration, but also to the country that we are in a moment of crisis. What we are seeing right now is a lot of our rights being violated. If we don’t do anything—May 1 and the caravan, all of it is preventative. It is to get to the point where we don’t have a catastrophe where we open up a Pandora’s Box of constitutional rights that are being violated left and right. But that is, unfortunately, what we are seeing with this Donald Trump administration. Everything from the ban and the raids and the deportations of people, the persecution by law enforcement of our immigrant communities when they pull them over and pressure them and use those pressure tactics to get them to sign away their temporary protected status or they only status that they have and they immediately give up their right to due process. The assaults that we are seeing on women at detention centers and the losses of that—we are experiencing a humanitarian crisis right now and it is Pandora’s Box if we let this happen because it means that all of our constitutional rights are at stake. SJ: Anything else people should know about Caravan or May Day or the work that you are doing? AV: Just that we really urge people to get involved, to get more information at CaravanAgainstFear.org. You can follow the caravan [on Facebook and Twitter], everything we are doing. Saying “no” to the persecution of immigrants, saying “no” to deportations and the separation of families, saying “no” to the mural, saying “yes” to resistance efforts, and shutting it down and going out on May 1. You can find all of that on CaravanAgainstFear.org. We will take it to the streets in the same way that we did in 2006. Si se puede.